At NASA's Merritt Island Launch Annex (MILA) tracking station, a 30-foot antenna was slewed for the last time during a closing ceremony on July 28, 2011. With no more radio signals to relay from space shuttles in flight, NASA parked a radio dish used to track launching and landing orbiters for the last time. 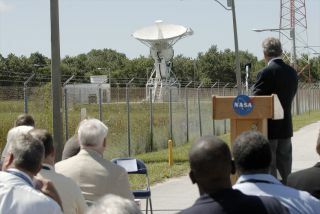 The antenna is one of two steerable 30-foot dish antennas at NASA's Merritt Island Launch Annex, or MILA, tracking and data station at the Kennedy Space Center in Florida. Its final reorientation from the horizontal to the vertical on Thursday (July 28) came as part of a ceremony to close the station after 45 years of service. With that final move, the MILA station — which was first established for the Apollo program and was responsible for tracking radio transmissions from every shuttle launch for 30 years — became a part of space history. "I understand MILA is going to be decommissioned after this flight," Chris Ferguson, commander of the final shuttle mission, STS-135, radioed through MILA's antennas on July 16, five days before landing the winged spacecraft for the last time. "For all the folks who work there and for all the shuttle missions that you've supported throughout the years, we thank you very much." Although MILA is located at the Kennedy Space Center, for most of its history it served as a Goddard Space Flight Center operation. The tracking station was originally established in 1966 by Goddard, which itself is located in Maryland, as part of a global, ground-based data network of 17 tracking stations that provided support to the Apollo moon landing program and Earth-orbiting scientific satellites. MILA's first active mission support was the reception of television signals from the Apollo/Saturn-203 (AS-203) mission launched July 5, 1966. An unmanned flight of the Saturn IB, the mission studied the performance of the liquid hydrogen fuel in the rocket's S-IVB stage to verify its on-orbit restart capability. With the transition to the shuttle and the deployment of the Tracking and Data Relay Satellite (TDRS) network of communication satellites, the use of most of the ground stations was gradually phased out. But MILA remained operational, serving the 30 years of the shuttle program. From the very first space shuttle mission (STS-1) in 1981 through the final flight (STS-135) last month, the MILA station served as the primary voice, data and telemetry communications link between the shuttle and the ground from launch until 7 1/2 minutes into the flight. "It's a combined effort between the Mission Control Center [in Houston] and the Launch Control Center [in Florida] getting together. The interface to those facilities is MILA, because it gets them their data they need to make [their] decisions," said Gary Morse, station director for MILA, in an interview published by NASA the day before the final mission launched. "We're getting command to the space shuttle, we're getting telemetry from the space shuttle, we're getting TV from the external tank, which is looking down at the leading edges of the wing surfaces to see if any foam or ice comes off. We are getting tracking data as soon as we lift off from our signal and sharing that with the flight dynamics facility at Goddard as well as the Mission Control Center in Houston." MILA was activated when the shuttles landed at Kennedy, relaying communications beginning about 13 minutes prior to touchdown. The most dramatic change for MILA in the years since STS-1 was from improvements in technology. The station transitioned to computerized workstations and its analog recorders and data tapes gave way to digital systems and fiber optics improving their reliability and bandwidth. As a result of these upgrades, MILA supported the missions of several scientific satellites, including the Hubble Space Telescope. But some things remained the same up until the end as they did for STS-1. The same pair of 30-foot, S-band dish antennas still tracked Atlantis as it launched on STS-135. These antennas also supported Atlantis' landing 13 days later. Live on-orbit television was frequently provided from these same antennas. Located behind Kennedy Space Center, west of its visitor complex — the tracking station's need for a clear line of sight sometimes affecting the shape of the visitor center's facilities — MILA's unassuming small building and field of antennas and arrays are now slated for demolition. "The end of MILA is officially six weeks from wheel stop. That's it. We hand the keys back to Kennedy Space Center and we walk away," said MILA station manager Martyn Thomas in a NASA interview. "The MILA mission ends." The tracking station is scheduled to close permanently on September 1. NASA plans for a new, state-of-the-art tracking station to replace MILA on the other side of the visitor center. The new station will support launches of the space agency's planned heavy-lift rocket for crewed missions beyond low Earth orbit. Visit collectSPACE.com for more photos of the MILA tracking station and its closing ceremony. Follow collectSPACE on Facebook and Twitter @collectSPACE and editor Robert Pearlman @robertpearlman. Copyright 2011 collectSPACE.com. All rights reserved.